Suppose you have a 100kW system with 30 strings, and string has a short circuit current of 8.5 at STC. How many combiner boxes should you use? Each 10 string combiner box will have a design short circuit current of 132A. 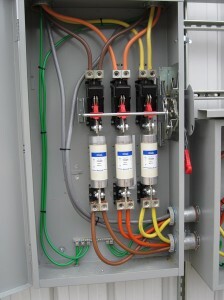 You must round up to the next size DC disconnect switch, which is 200A which costs $700 materials plus $700 labor. Therefore you are buying three disconnects but only using 66% of the capacity on each. The total cost for the three disconnects is $4,200, with $1,400 of that ($466 per combiner box) being wasted unused capacity. Each 15 string combiner box will have a design short circuit current of 199A. This would also go on a 200A disconnect, but uses the full capacity of the switch. The total for the two 200A disconnects is $2,800, and no money is wasted on unused capacity. Small but wise decisions during the engineering stage make big differences on the cost of construction. In this example a properly value engineered design will save the client $1,400 (1.4 cents per watt), all while making no sacrifice on performance or quality. When you start the design of a project, before you start breaking the system up into sub arrays, keep in mind the sizes on the equipment and always try to use the full capacity of the equipment you have before adding the expense of another component.